If you visit our website restministries.com or our Sunroom (currently undergoing updates) Kerryn’s name is familiar to you. We are so thankful she decided to “do something” here with us. Until recently, I didn’t know this came about until Lynn shared: “I first got to know Kerryn as she was making encouraging comments on the Rest Ministries daily devotionals. She had such an upbeat style of expressing herself that I was immediately drawn to her. She was someone I wanted to get to know! . . . I asked Kerryn to answer a few questions so I could make sure I got the details right as I shared with you about her. So! You live in Australia! I live in the beautiful Adelaide hills of Australia with my wonderful husband and 3 adult sons. We are blessed to have Aussie wildlife that visit us on our steep bush property including: koalas, kookaburras, bandicoots, and even an echidna. Prior to illnesses I was a special education teacher and very involved in my church. Now my husband is my carer and he also cares for two of our sons that have illnesses and disabilities. Since illnesses I enjoy writing devotionals for Rest Ministries, meeting up with friends online in the RM Sunroom and crocheting. I have CFIDS (chronic fatigue and immune dysfunction syndrome), MCS (multiple chemical sensitivities), IBS (irritable bowel syndrome) and hemachromatosis. My “life verse” is: “Trust in the Lord with all your heart and lean not on your own understanding; in all your ways submit to Him, and He will make your paths straight” (Proverbs 3:5-6). My verse for difficult times became important to me when I first became ill and could barely lift my head due to fatigue. I is often the verse that I turn to in tough times. What is a fun random fact you can share with us? My husband was a clown for 20 years part-time and 5 years full-time. Can you imagine going to a bank manager together for a house loan and having to state his career as “clown”?! It was a special career that took our family to many interesting places in Australia and overseas. Do you have any social media contacts you would like us to share with our audience? Currently I’m not on any social media, as I find it too exhausting. I hope to change that sometime in the future! I stumbled upon Rest Ministries one night when I was desperately lonely and sad. Through it God brought a light into the darkness for me when the losses were all engulfing–having lost my health, career, church ministry, energy for outings, and many friendships. Thank you for Rest Ministries, Lisa. “We have become very good friends, even with the geographic distance–which does not seem a factor for those of us who are online friends. We began corresponding more personally. With more than a few nudges from me–seeing the joyfulness of her style of expressing encouragement to others–I suggested she consider submitting a couple of devotionals to Lisa, as I felt she would be such a wonderful asset to our devotional writer’s team. She did . 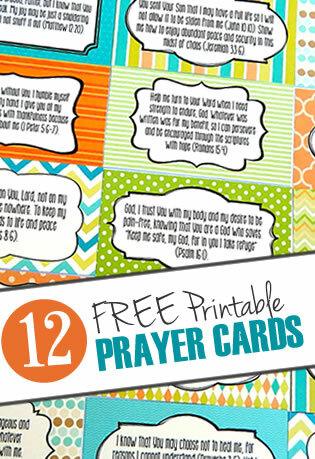 . .
“I have come to ‘know’ her family through photos sent and prayer needs shared for them. I love this woman!” says Lynn. So we would like to say thank you to Kerryn Wright, with our deepest appreciation for how you bless the people here at Rest Ministries. You create a joy bubble wherever you do, and you are always working behind the scenes to make sure those who visit our site feel comfortable, cared for, and seen by someone–especially God. 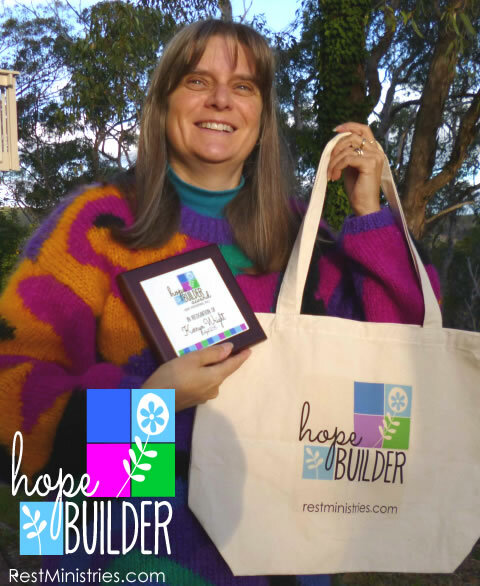 Congratulations to Kerryn as the first recipient of our new Hope Builder Award. Do you know someone who should be nominated for the Hope Builder Award? Submit the details today. Lisa Copen is honored to have such amazing, inspiring Hope Builders who surround her–especially when she is having a hard day herself. It is the relationships like this that build over the miles that make Rest Ministries a source of joy and Lisa can’t wait until we all get to sit and laugh together someday in heaven. Filed Under: Announcements, Articles, Devotionals, Finding Purpose, What's New? Congratulations Kerryn! I have been reading Rest Ministries Devotionals for over a year now and all of the writers are amazing. And today, I truly appreciate YOU. I really related when I read your “bit about yourself”. I believe lots of us have made it to RM while searching the website in pain for some kind of answer. I believe RM is one of them. And I hope to one day start a Hope Keepers ministry group. I believe that is a purpose that God has put in my life since my own on going issues with chronic pain. Oh thanks HEAPS Donna! 🙂 It’s been lovely to see your comments on devotionals. Yes, I’m sure that the story is pretty common about the dark time we’re in & then God leads us to RM! Praise Him!! I still remember that it was an awful night I was having & found myself here. I read one of Karlton’s devotionals & suddenly felt like someone understood how I was feeling & yet still had deep faith in God. Special! What a wonderful choice for the first Hope Builder award! Kerryn is such an encourager. Anyone who reads her devotionals or comments finds honest, human words. She identifies with our trials in such a relatable way. Every corner of RM is sprinkled with her gratitude to God. Her worshipful attitude is an inspiration to all who visit RM. I’m honored to know such a graceful, godly woman. And to count her as one of my friends. I’m sure you know by now that your devotionals ALWAYS seem to hit a deep chord in my heart. I guess that our very similar career paths, & even having a child with disabilities, makes that heart connection really easily. I’m DELIGHTED that I’m your friend Vicki. Thanks again. God bless. LOTSoluv Kerryn PS. That prism in my lounge room window reminds me of you more often than you could possibly know! Although there are many wonderful encouragers among all who visit and volunteer here at Rest Ministries, Kerryn is surely the one I’d choose to be the first recipient of this award/honor. I am so glad she was – the first! I loved reading through the comments within the article as each was so consistent as to the woman we have come to admire and know. 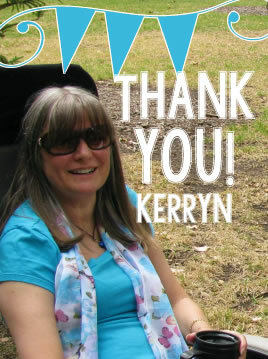 Congratulations, Kerryn – for gracing each of our lives in such beautiful ways! What can I say?! I’m so very thankful, encouraged, humbled AND stunned with this post! WOW! I’ve been speechless since reading this a few hours ago…. not like me!! 😉 Thanks HEAPS for the effort that went into this & sending my treasured award & tote bag, which I’ll use for my crocheting. You are sneaky…… in a thoughtful way!! 😉 The comments from my dear devotional writer friends are such a treasure! Typical of me….. I was brought to tears! I chuckled at the cropping of that photo that I sent you from my son’s engagement party too!! Soooo much behind the scenes stuff that you’ve been doing for this. I’m so incredibly grateful to you Lisa. You’re amazing! Kerryn, I did get an email about this and asked about writing later, and I still missed it! So sorry! I tend to put things off until I think I can take time to “do it better”. I surprise myself sometimes, having lived this long and still not figuring out that “waiting until a better time” rarely works. You are one of the best things that has ever happened to the Sunroom. You have continued to encourage and uplift others, no matter what you’ve been going through yourself. Even with having stepped back a bit, you do more than most here. When I would have stopped wishing birthday greetings to people we never “see” or have not seen in a very long time, you asked us to continue, having seen how much it mean to someone to be remembered. Everyone who has been in the Sunroom for ANY length of time knows Kerryn, and is better off in some way because of it. I could say more but I’m tired and if I continued, Kerryn might not be able to float down off the ceiling or perhaps get her head through the door. [LOL] Just kidding. I’m quite overwhelmed with your beautiful comments. I saw them yesterday, but was speechless again & didn’t know what to say in thanks….. ‘coz “thank YOU” just doesn’t seem enough. I really chuckled with your final comments!! 😉 LOVE how you keep me grounded!!! It’s actually been a good test from God to give the thanks & glory back to Him, so that I DON’T get a bruised head going through doorways!! 🙂 Quite seriously it has been a good lesson amongst this. Kerryn, I was so happy to hear you won this award! You are a great blessing to me and all the groups you are a member of. I agree with everyone else’s comments as to all you do for us. Wish you lived closer so we could meet sometime. But, since I’m homebound due to MCS also I understand your inability to leave house much. Big hug to you, my friend! May God send many ore blessings your way and answers to all your needs! Awweee….. thanks soooooo much Gail! 🙂 You are thoughtful writing that to me, as I know you’ve been having a rough time lately with energy. It means a LOT to me, so thanks buddy! Vicki, I chuckled at your mention of mannequins!! Here we go connection again!….. It was only in the past week that I sent a funny memory about mannequins to Fiona. It had me in stitches writing about it & gave her the giggles too! I might see if I can find it to send it to you too!